With 2011 around the corner, you know that it’s time to get a new look for your home. But guess what? It’s not always about carpet and curtain (How many of them are collecting dust in your storeroom?!) A new piece of painting or sculpture can speak volumes in redefining your living space. Numerous experimental and major home exhibitions held this year means an expanding and more appreciative art market in this country. In fact, it is not unusual to see commercial art dealers joining property and interior exhibitions. Admittedly, it is a prevailing trend that Malaysian public has gotten more exposure – thus appreciation – on the role that art pieces play when it comes to home décor. But ditch your department store’s Van Gogh for investment-worthy pieces. So if you’re already thinking about a four-figure sofa, think again, because refashioning your home can be as simple as adding a new piece of artwork to the house. And we know just what and where to get them. 2010 has been an exciting year for the art world in Malaysia. Contemporary art exhibitions, held in major exhibition halls and private galleries alike, have arguably generated public interest in this particular art genre. Tirelessly pushing the boundaries of contemporary art is Wei-Ling Gallery. This year alone, the gallery has held nine exhibitions. Following numerous successful exhibitions such as The Tiger Show and more recently, Inconsequential Consequence of Hope, the gallery is all set to hold Absolut 18@8 Art Exhibition, a yearly exhibition sponsored by a leading alcoholic beverage label, Absolut Vodka. First held in Malaysia in 2006, Absolut 18@8 Art Exhibition is one of the most anticipated shows on the art calendar here. “The 18@8 exhibition has become a definitive event on the Malaysian art scene as it consistently features contemporary artists who have made waves in the preceding year and will be the ones to watch out for in the year ahead. A veritable smorgasbord of talent adorns the artist line-up every year, bringing together new and familiar talent alike. “Over the years, each 18@8 exhibition has had a different theme to inspire the artists to push boundaries to come up with works which are both compelling and iconic and allows them to experiment with new themes and ideas. This collaboration with Absolut is bound to inspire them further,” she adds. Well, it pays if you know a thing or two about pop culture, where everything associated with Andy Warhol is cool (read: investment worthy!). Absolut Vodka’s collaboration in 1985 with Andy Warhol resulted in an iconic painting of sort. The pieces exhibited at Absolut 18@8 Art Exhibition here, unsurprisingly, are edgy, provocative and modern. Take for instance, Gan Tee Sheng’s Absolut Party. Capturing what looks like a chaotic party scene in a living room – with Absolut Vodka bottle thoughtfully placed in the middle – the painting sees a combination of subdued colours such as black, white and purple. There’s a sense of humour, albeit a dark one, in this particular work. Gan, whose works have been consistently depicting human figures within a closed interior setting, forges a contemplative art piece that would work best when placed in a modern house. A piece from Chin Kong Yee is another stunner. 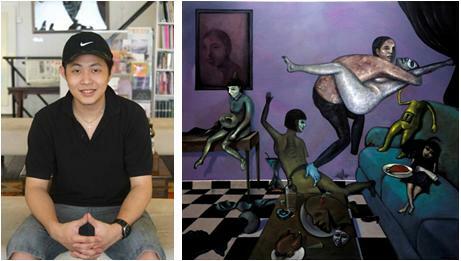 Chin, who describes his works as “Actuality Accorded Painting (AAP)”, whereby, he believes that an object must have existed in reality in order to be captured in the canvas. And his compelling artistic philosophy does translate well into the canvas. For 18@8, Chin showcases a thought-provoking piece of painting that looks almost multi-dimensional. With significant strokes of blue and yellow, the piece depicts a dual perspective of what seems to be a similar space. Check out the works of both established and young talents such as Ivan Lam, Anurendra Jegadeva, Chee Meng, Hamidi Hadi, Annabelle Ng, Al Khuzairie Ali, Chee Eng Hong, Chee Way, Cheng Yeng Pheng, Cheong Tuck Wai, Choy Chun Wei, Chin Kong Yee, Faizal Suhif, Gan Tee Sheng, Stephen Menon, Yau Bee Ling and Yim Yen Sum at Absolut 18@8 Art Exhibition. Absolut 18@8 Art Exhibition opens from 30 November 2010 – 2 January 2011 at Wei-Ling Gallery.